As the name implies, Bavarian Porcelain refers collectively to chinaware & decorative porcelain that is made in Bavaria, Germany. Although there is no specific style or other distinguishing characteristics for porcelain from Bavaria, as for example is the case for Dresden, one of the reasons that this term is popular with collectors & antiques dealers is that, in addition to a number of brand-name manufacturers in the region, there is also a multitude of US- or Germany-based Importers & Exporters that traded luxury goods from Bavaria and simply marked these items as "BAVARIA". Most of these items are made in Bavaria as finished goods in their entirety (blank-ware production + decoration) and some were imported to the US as white-ware that were subsequently decorated by local studios. Furthermore, some were made to order (subcontracted) to be sold exclusively by certain high-end retailer chains. 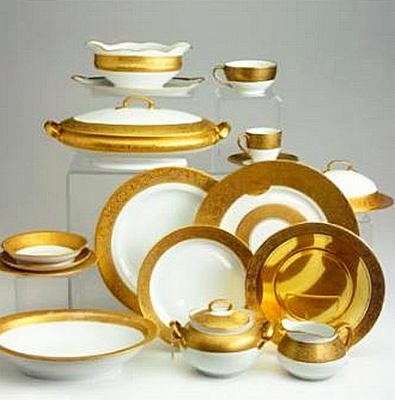 These wholesale porcelain products are of high quality and merit the same attention as items crafted by known makers. Generic Bavarian porcelain is usually marked with a trader's logo and rarely includes the original manufacturer's name. Some even have an "overmark", which basically is an extra backstamp or other masking trademarks that hides the actual maker. In the past, such items were frequently made by lesser-known companies that were slowly being introduced in the market under the general banner of the Importer, rather than on their own brand. This practice continues to this day, yet there is a sharply reduced output from Germany, mostly because of costs, and the porcelain tableware or figurines we now see in the shops are usually made in China and decorated or finished in Bavaria. Traders' marks tend to be somewhat more embellished than those of the various porcelain factories and often feature a representative emblem of Bavaria, most notably the roaring lion or a crown or the region's Crest and other such symbols. To research Bavarian porcelain marks, please see our Ceramics marks guides. In spite of this activity of marketing generic Bavarian porcelain, that had reached its peak around 1880s - 1930s, there are many famous names of actual manufacturers from the region, some no longer in existence, that have crafted dazzling works of art and functional pieces in porcelain (and pottery). These include C.M. Hutschenreuther, Schumann, Alboth & Kaiser, Martha Budich [decorators], Thomas, Moschendorf, Zeh, Scherzer & Co., Winterling, Sandizell, Johann or Christian Seltmann, Tettau and many others. All vintage Bavarian porcelain is collectible and of the utmost quality. Decorative styles vary only slightly, using themes and compositions that resemble other German makers, such as Meissen, or of Romantic & Neoclassical designs and also floral motifs. Below are some examples of Bavarian porcelain of all types from our Pricing Guides database. Schumann Bavarian Porcelain Bread Dish floral, fancy openwork. Pair of Schumann Bavarian Porcelain fruit plates. Handpainted Bavarian Porcelain Cake Plate Arts & Crafts design. Handpainted Bavarian Porcelain Nut Bowl, artist signed, oval. Bavarian Porcelain Dresser Tray, floral decor.